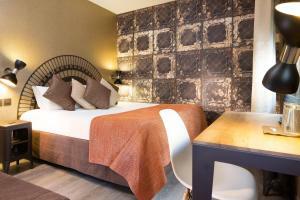 This 4-star, design hotel is located 550 metres from the Arc de Triomphe and Champs Elysées. It offers soundproofed guest rooms with free Wi-Fi access and a minibar. Tea and coffee making facilities and satellite TV are provided in each air-conditioned room. Most of the rooms feature chromotherapy lighting, and have a contemporary décor. Some rooms also have a balcony. An American buffet breakfast is served every morning in the bright dining room at hotel Paris Arc de Triomphe Etoile. A ticket service is provided at the 24-hour reception in Mercure Paris Arc de Triomphe Etoile. Guests also have access to the computer in the lobby. The flower market at Place des Ternes is only 150 metres from the hotel and the Palais des Congrès is a 10-minute walk away. 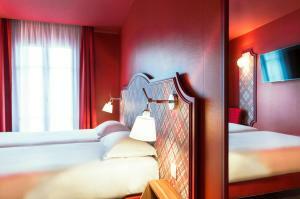 When would you like to stay at Mercure Paris Arc de Triomphe Etoile ? This air-conditioned room features a flat-screen TV, a minibar, free Wi-Fi and tea and coffee making facilities. The private bathroom is fitted with a bath or a shower and a hairdryer. Features a furnished balcony and chromotherapy lighting. Toiletries, slippers and bathrobes are included in the bathroom. A Nespresso machine and a minibar with soft drinks are also provided. This family room has air conditioning, minibar and electric kettle. Each day we'll check prices and send you an email for your selected dates at Mercure Paris Arc de Triomphe Etoile. If you don't have specific dates but would like to check prices for say next weekend or say next month we can check the price too. Click to write a review and share your experience of Mercure Paris Arc de Triomphe Etoile with other travellers.